Presently, a slow but steady large scale technological change is taking place: The traditional incandescent bulb is being replaced more and more by special semiconductor devices called light emitting diodes or LEDs. Over the past decade, LEDs have caught up in efficiency and now offer an economical alternative to incandescent bulbs even for bright signal lamps such as traffic and automotive lighting. A high percentage of an incandescent bulb�s total light output is lost when passed through a coloured filter. In contrast, an LED emits light of only the desired color, thus no filtering is necessary and consumption of electrical energy can be reduced by up to 90%. Low power consumption and a typical LED lifetime of 100,000 hours (compared to about 1000 hours for incandescent bulbs), drastically reducing maintenance, often equates to significant overall cost reduction when LEDs replace traditional lighting. As an example, the city of Denver, which recently has replaced some 20000 incandescent bulbs in traffic light signals with LED devices, estimates the total savings to about $300 per signal, calculated for the lifetime of an LED device. At the current level of technology, the broad application of LED devices as sources of artificial light is restricted by comparatively high production costs. However, the LEDs high-energy efficiency and low operating voltage leads to their use when power consumption is a critical parameter as when batteries or solar cells must be used to power the lamps. Fig. VI.22. 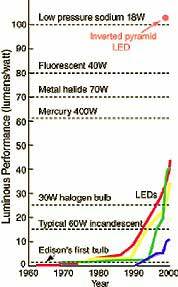 Efficiency of red, green, white and blue LEDs has dramatically increased during the last decade. The most commonly encountered monochromatic source is the laser. Because of its monochromatic and coherent radiation, high power intensity, fast modulation frequency and beam orientated emission characteristics, the laser is the primary source used in fiber optic communication systems, range finders, interferometers, alignment systems, profile scanners, laser scanning microscopes and many other optical systems. Traditional monochromatic radiometric applications are found in the range of optical spectroscopy with narrow band-pass filtered detectors and scanning monochromators used as monochromatic detection systems or monochromatic light sources. Optical radiation describes the segment of electromagnetic radiation from l=100 nm to l=1 mm. Most lasers used in measurement instrumentation and fiber optic telecommunications systems work predominantly in the 200 to 1800 nm wavelength range. Because of the monochromatic emission spectrum and fixed output wavelength, detectors used to measure laser power do not need a radiometric broadband characteristic. This means that the typical spectral sensitivity characteristic of Si or InGaAs photodiodes can be used without requiring spectral correction. For absolute power measurements the bare detector�s spectral response can be calibrated at a single wavelength or over its complete spectral range (typically done in 10 nm increments). The corresponding calibration factor for that specific wavelength is selected when making the laser power measurement. Some meters offer the capability of selecting a wavelength by menu on the display. The meter then calculates the reading by applying the calibration factor for the wavelength selected and displays the measurement result. � Lasers with collimated (parallel) beams are typically measured with a flat-field detector, whose active size is larger than the laser beam diameter. Because of the high power of lasers, the responsivity of the detector may have to be reduced by an attenuation filter. But there is a risk of measurement errors due to polarization effects, surface reflections from optical surfaces in the light path and misalignment of the beam on the detector. � Lasers with non-collimated (divergent) beams cannot be measured with a flat-field detector because of the different angles of incidence. The power output of these lasers is typically measured with detectors combined with an integrating sphere which collects all incoming radiation independent of the angle of incidence. Through multiple internal reflections, the sphere offers high attenuation for high power measurements. The max. power is limited by the sphere�s upper operating temperature limit. The sphere port diameter can be enlarged by increasing the sphere diameter which allows measurement of larger diameter beams. Although very useful, laser radiation can pose a health risk to the human eye. Even stray-light from lasers may be hazardous due to the typically high power levels found. The EN 60825 standard describes the risk and measurement methods for risk classification. Laser stray-light can be assessed with the use of a detector head with a 7 mm dia. free aperture to mimic the open pupil. Gigahertz-Optik offers laser classification service in cooperation with the T�V Bayern for low intensity lasers in the range from 350 to 1070 nm (accor. EN 60825-1).